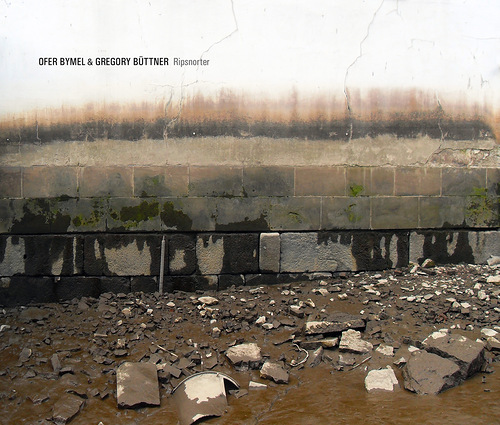 Ofer Bymel & Gregory Büttner 'Ripsnorter' - Collaboration of Israel drummer and experimentalist Ofer Bymel with German sound artist Gregory Büttner. The album contains two long improvisations, the first recorded in Gastatelier Fleetinsel (where Ofer got an artist residency for one month) and the second recorded live at "Blurred Edges" Festival in 2010 in Hamburg. There with Ofer breathes through his instrument and handles it with a lot of extended techniques; Gregory plays his sounds using a laptop through small loudspeakers which he prepares or plays with resonating objects. As a result the record gives an impression of a perfect melting of acoustic and electronic sounds. Mêlée recorded on April 27th, 2010 at Gastatelier Fleetinsel in Hamburg. Potboiler recorded live on May 1th, 2010 at blurred edges festival in Hamburg. Cover foto by Gregory Büttner. Foto inside by Gunnar Lettow. A duet of Ofer Bymel on drums and Gregory Büttner on laptop, speaker and objects. The two pieces were recorded on two different dates in 2010. Obviously this is improvised music, but somehow sounds a bit different than what we usually hear in this area. It all ...seems to me heavily object based, electro-acoustic by nature, in which the drums are treated like an object too. The rattling of objects on the drum skin, along with whatever objects Büttners using in combination with the crackling, hissy, sustaining sounds produced by the laptop of Büttner make up two excellent pieces of music. Both play very careful with a strong emphasis on 'hearing', rather than an overload of sounds. A minimal approach which seems isolated to few sounds, or sometimes even a single sound each time, with that curious electronic processing going on, along with the spatial nature of using a variety of small speakers. Quite intense music, simply because there is not always a lot happening. Quiet music for a refined nature.